Our website care plans means you can relax knowing our team is taking care of everything, so you can focus on your business. We keep your software and WordPress up to date to ensure that your website performs at its peak and functions at all times and apply updates as soon as they are available to prevent any security issues. We protect your website and database with backups every day, week or month, depending on your plan, so if you ever have any security issues we can revert your website back to any previous state instantly. The worst thing about malware is that it could be on your website for months without you even noticing. We need to be vigilant, proactive, and check regularly for malware and known vulnerabilities. We keep up to date with all the latest security threats and vulnerabilities and ensure your website scripts and server code is always kept up to date to prevent any security breaches. WordPress and plugins need to be updated regularly to ensure your website performs and works as it should. Sometimes these can cause a conflict with other plugins, so we validate during updates. It’s important that your website is online 24/7, so we monitor your website uptime to ensure that it is always online and we are notified of any issues to get it back online instantly. Our website care team will send you a report every week that will show you every piece of software thats been updated, backups carried out and security scan results so you can see exactly what we have been doing every month to keep your website secure and have piece of mind that our team is taking care of things. Do I need to worry about security for my website? It is essential that you keep all your website software, plugins up to date to avoid any security issues. It also essential to keep backups of your website and update your security code regularly to protect you from the all the latest threats. Wordpress is secure as long as you keep your core site and your plugins updated and always use trusted plugins. WordPress is the most popular content management system online today with 30% of all websites powered by it (90 Million), so it is well used and perfectly safe to use, but due to its popularity, it is targeted. Attackers are constantly looking for ways to hack websites, so we just need to follow these few recommended steps and keep everything secure, up to date and backed up to prevent any issues. What happens if I dont do follow these recommended security steps? If you don’t secure, backup and update, your website is likely to run into issues. It might just be that your website will stop working, certain plugins, WordPress or features on your website will stop working, but more importantly it can leave you exposed to hackers. Have we had any security issues? We have had no reported issues (touch wood since we started following all the recommended steps from WordPress, Sucuri and all the main security developers and regulators. We have fixed and re-designed dozens of clients websites that have come to us and been let down by their previous web host that have been hacked and its all due to the same reasons, outdated plugins, poor website security and no backups. What are the main causes of security breaches? The main cause of security issues is always out of date WordPress, core code, out of date plugins or poor quality plugins, shared hosting environments, poor passwords etc so we ensure we follow all the recommended steps to ensure that your website is always safe, secure, up to date and backed up. What happens if I get hacked or my site breaks? The whole purpose of our website care plans is to secure your website to prevent this happening. If you use our secure, update and backup service, you should not run into any issues, but if for some reason you were compromised, we just revert you to one of your backups and have you back online within minutes and then we would look at the cause of the compromise and fix accordingly. What if I don't have any backups and my site is compromised? If you are not on our website care plans and have not backed up your website then it can be very costly to try and remove all the malware from your website and we would forward you onto our malware removal experts. Sometimes it is not possible to totally clean it up and you are better off just re-doing your website on a clean WordPress install so that is why its important to keep your website secure and backed up. How will I know my site is secure and what you have done? 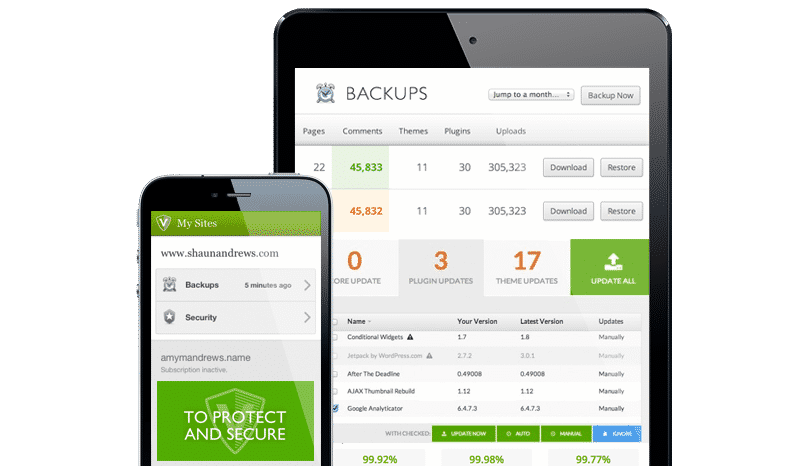 We will send you a security report every month that will show you all the backups completed for your website and all the core website, security and plugin updates done for that month. We will also notify you of any threats and what we did to protect your website. How do I keep my website up to date? Keeping your website up to date, backed up and secure can be very time consuming and a little tedious. The technology and security issues continues to evolve at such a pace that there is just no way you can keep up with the latest vulnerabilities and security threats. We offer a service which allows you to focus on your core business and we handle the rest. NEED US TO PROTECT YOUR WEBSITE?